Cast saw devices are important orthopedic equipment employed in removal of casts that are utilized for fracture management. Bi-valving method is used to cut the cast with the help of an oscillating blade that is safe and prevents any cuts or injuries to the patient’s skin, on contact. However, demand for cast saw devices is anticipated to increase during the forecast period owing to the rise in incidence of non-fatal injuries and growing burden of osteoporosis. The global cast saw devices market was valued at approximately US$ 150 Mn in 2017. It is anticipated to reach a value of nearly US$ 200 Mn by 2026, and expand at a CAGR of 4% from 2018 to 2026. 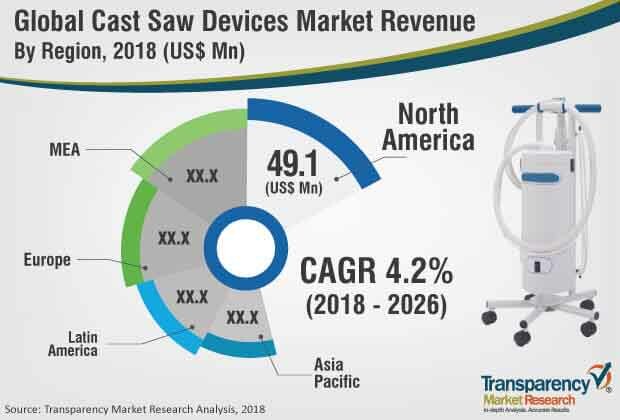 Surge in incidence of non-fatal injuries and rising concerns about osteoporosis are likely to fuel the global cast saw devices market from 2018 to 2026. There are several unmet needs in global cast saw devices market, which create lucrative opportunities for existing players and new entrants, globally. For example, campaigns carried out by government and non-government organizations are likely to increase awareness among people regarding different orthopedic diseases. Additionally, the geriatric population is susceptible to numerous musculoskeletal diseases such as osteoarthritis and osteoporosis. Consistent rise in the geriatric population is anticipated to offer significant opportunity to the cast saw devices market during the forecast period. The global cast saw devices market has been segmented based on saw type, application, end-user, and region. In terms of saw type, the cast saw devices market has been classified into electric saw without vacuum, electric saw with vacuum, and battery operated saw. Expansion of the electric saw without vacuum segment can be attributed to the utility as well as cost associated with the device, which is significantly lower, as compared to that of the other saw types. Based on application, the cast saw devices market has been categorized into plaster of Paris (PoP) cast removal and fiberglass cast removal. Expansion of the fiberglass cast removal segment is attributed to the increasing preference for fiberglass cast over traditional plaster of Paris cast among patients as well as doctors and orthopedic cast technicians. The disadvantages associated with the use of plaster of Paris (POP) cast, such as extended drying period, excessive weight, and messy application process, are expected to decrease the usage of this cast in fracture management. These disadvantages of POP cast are projected to fuel the demand for fiberglass cast during the forecast period. In terms of end-user, the cast saw devices market has been divided into hospitals, clinics, and ambulatory surgery centers. The hospitals segment is anticipated to hold a prominent share of the market by the end of 2026, as most trauma cases and those related to fractures are handled by hospitals. Additionally, increasing investments in hospitals across the globe is expected to further boost the segment during the forecast period. North America (NA) accounted for a notable share of the global cast saw devices market in 2017, followed by Europe. Increase in health hazards associated with dust released during cast removal and rise in awareness among doctors and patients about the benefits of electric saws with dust extraction systems are expected to fuel the demand for the cast saw devices during the forecast period. The fiberglass cast removal segment is anticipated to expand at a rapid pace during the forecast period. It is expected to be a highly lucrative segment from 2018 to 2026, due to increase in adoption of fiberglass cast among doctors and patients owing to benefits such as lightweight, water resistance, as compared to plaster of Paris cast removal. Key companies operating in the global cast saw devices market and profiled in the report include Essity Aktiebolag, De Soutter Medical, Smith & Nephew plc, Stryker Corporation, HEBU medical GmbH, McArthur Medical Sales, Inc., Medezine Ltd., Rimec S.R.L., Prime Medical, Inc., Shanghai Bojin Medical Instrument Co., Ltd., Hanshin Medical Co., Ltd., and OSCIMED SA. Cast saw devices are important orthopedic equipment employed in removal of casts that are used in fracture management. Bi-valving method is used to cut the cast with the help of an oscillating blade that is safe and prevents any cuts or injuries to patient’s skin on contact. However, demand for cast saw devices is anticipated to increase during the forecast period, owing to rise in incidence of non-fatal injuries and growing burden of osteoporosis. The global cast saw devices market report comprises an elaborate executive summary, which includes a snapshot that provides information about various segments of the market. It also provides information and data analysis of the global market with respect to the segments based on saw type, application, end-user, and region. A detailed qualitative analysis of drivers and restraints of the market and opportunities has been provided in the overview section. Additionally, the section comprises competitive matrix and company profiles along with business overview to understand the competitive landscape in the market. This section of the report also provides market attractiveness analysis by geography and market share analysis by key players, thereby presenting a thorough analysis of the overall competitive scenario in the global cast saw devices market. The global cast saw devices market has been segmented based on saw type, application, end-user, and region. Based on saw type, the cast saw devices market has been classified into electric saw without vacuum, electric saw with vacuum, and battery operated saw. Based on application, the cast saw devices market has been segregated into plaster of Paris (POP) cast removal and fiberglass cast removal. In terms of end-user, the cast saw devices market has been divided into hospitals, clinics, and ambulatory surgery centers. The market has been analyzed based on price variations, technology trend, and presence of key players. The market size and forecast for each of these segments have been provided for the period from 2016 to 2026, along with their respective CAGRs for the forecast period from 2018 to 2026, considering 2017 as the base year. In terms of region, the global cast saw devices market has been segmented into five major regions and the key countries in the respective regions: North America (the U.S. and Canada), Europe (the U.K., Germany, France, Spain, Italy, and Rest of Europe), Asia Pacific (China, India, Japan, Australia & New Zealand, and Rest of Asia Pacific), Latin America (Brazil, Mexico, and Rest of Latin America), and Middle East (South Africa, GCC Countries and Rest of Middle East & Africa ). The market size and forecast for each of these regions and the mentioned countries have been provided for the period from 2016 to 2026, along with their respective CAGRs for the forecast period from 2018 to 2026, considering 2017 as the base year. The research study also covers the competitive scenario in these regions. The report also profiles the major players in the market in terms of various attributes such as company overview, financial overview, product portfolio, business strategies, and recent developments. Major companies profiled in the global cast saw devices market include Essity Aktiebolag, De Soutter Medical, Smith & Nephew plc, Stryker Corporation, HEBU medical GmbH, McArthur Medical Sales, Inc., Medezine Ltd., Rimec S.R.L., Prime Medical, Inc., Shanghai Bojin Medical Instrument Co., Ltd., Hanshin Medical Co., Ltd., and OSCIMED SA.